← National POW/MIA Recognition Day 2012 – Do They Know? Today, January 10, 2013 is the 43rd anniversary of the loss Firebird Nine One and crew. It’s been 43 years of one of life’s bitter events, a tragic casualty of war. Four families and countless friends and comrades spent years waiting, wondering, searching and never giving up hope, yet finally realizing our loved one isn’t going to walk through the front door ever again. We moved on with our lives, yet we never gave up hope. We held on, and still hold on to those precious memories of life and times before January 10, 1970. We stood fast to honor and never give up the cause to locate the missing crew of Firebird Nine One. We joined the National League of Families in hopes of spreading the word for support in never forgetting our missing and to keep our government powers searching for answers. We prevailed, and although the League is struggling financially, it still remains active today. It’s a bittersweet event of life. Sadly, it gives closure to the hope of them returning alive, and closure to their fate but it never closes them in our hearts. One cannot truly express the emotions that erupt when news of remains have been identified. It’s years and years of hope, the unknown that turns into final grieving, and it’s a hard process. Never forget our fallen soldiers, our missing soldiers, our veterans, our active military personnel and their families. There are still over 1,600 missing soldiers just from the Vietnam war. Thousands and thousands from all wars. Honor them as they have honored you and may God Bless us all. 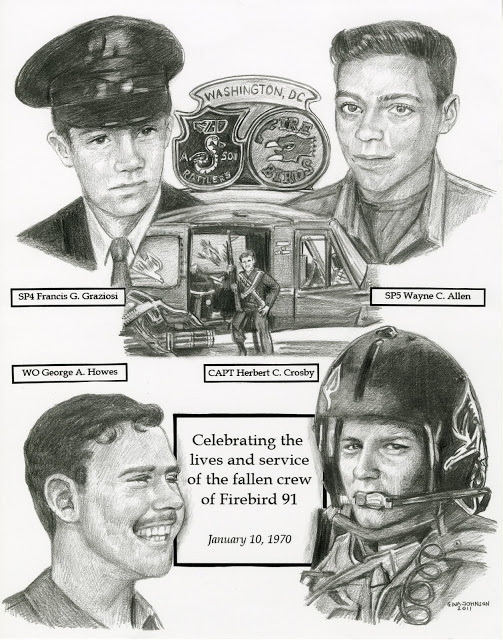 Today I salute and stand tall in honor and memory of Firebird Nine One, my brother, Capt. Herbert C. Crosby, and his crew that fatal day WO3 George Andrew Howes, WO1 Wayne C Allen, and WO1 Francis G. Graziosi, all U.S. Army. This entry was posted in Firebird Nine One Crew, Rattlers and Firebirds. Bookmark the permalink.